Are you a person that simply loves sleeping in the outdoors? If you are, then you definitely know the difference a good night’s sleep makes to your outdoors adventure. But, do you have a problem choosing the right sleeping bag that will provide both comfort and warmth when needed? Have you considered down models? 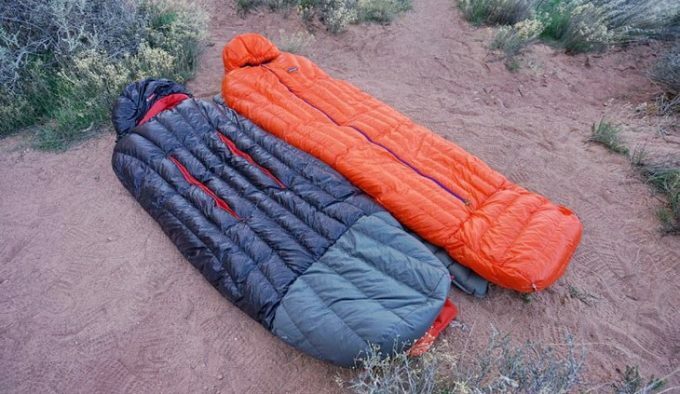 If you have, how do you know which model can be considered as the best down sleeping bag? 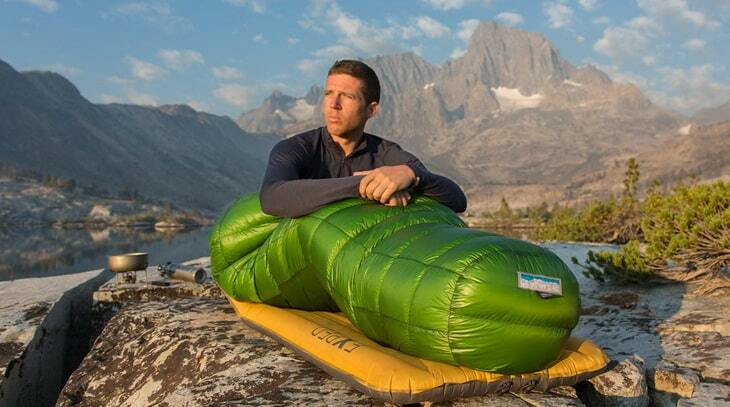 With so many sleeping bags on the market, it really is hard choosing a high-quality one that will fit all your needs. So, how do you find that perfect model that was made just for you? First, you need to realize that a sleeping bag should keep you warm and dry. A good sleeping bag will offer those as a minimum, plus a few more features, depending on your chosen method of camping and preferred sleeping arrangements. So, now that we got that covered, where to start? Easy, you just need to know what to look for, which features are important, and spend hours and hours of internet research. Doesn’t sound that easy actually, does it? 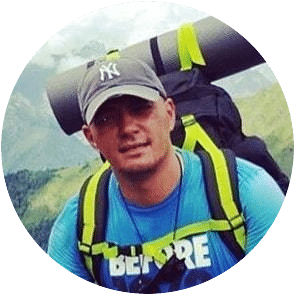 Don’t worry, we have made a list of reviews for the best down sleeping bags and also included some tips that will help you know which model is the most suitable one for your personal needs. Keep reading to find out more. 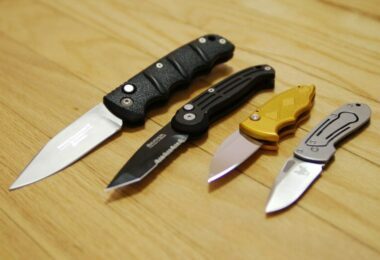 Make sure you don’t just look at one factor when deciding on a piece of outdoor equipment. Shopping around a little, allows you to reach an understanding of your actual needs and the several options available to you. 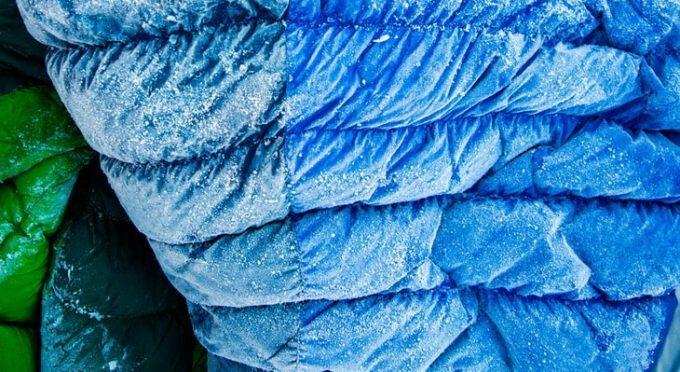 There are several factors you should consider before purchasing a down sleeping bag. In general, the more complicated the cut required and the more difficult the sewing technique, the warmer the sleeping bag, the higher the price. Down tends to require more complicated techniques because of its small size and the fact it needs to be retained in certain areas to ensure it can do its insulating job. 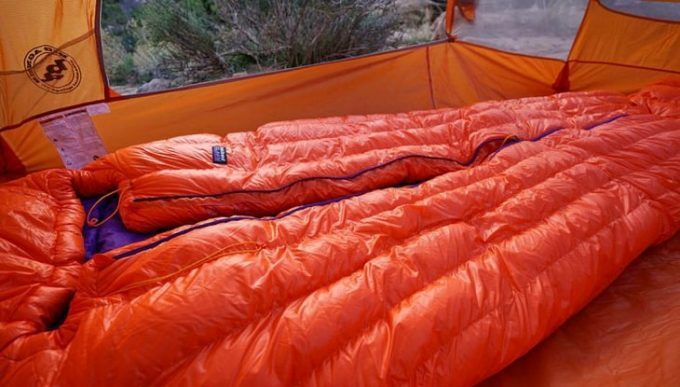 Synthetics are much easier to work with so are often much less expensive sleeping bags for that and other reasons. Box construction– All layers are sewn through for one quilted layer. Inexpensive but greater heat loss. Side Block Baffle– Baffles go from side to side, but not all the way around the bag, so filling remains top and bottom. The baffles can be curved across the bag. Continuous baffle– An inner baffle that forms a space between outer and inner layers trapping air in the insulation. The baffles run from front to back so the down can be moved top to bottom or vice versa depending on how warm you need to be. V-Shape Block Baffle– The V-block baffles ensure that even less warm air can escape. Extra to all these is the possibility of adding extra insulation features like V-shape side baffles along seams and draft tubes along the length of the zippers, insulated collars around the neck and the hoods. Even the inners and outers, can have differentials in size of fabric cut to attempt to help the insulation remain lofted and full with warm air to keep you cozy. In warmer weather ventilation can be an issue too, so bags with the ability to make ventilation for your feet or arms can be a bonus. If you need this, make sure the zipper is double ended and preferably locks in place. At the end of the scale, some mummy bags can be purchased with right and left opening zips. This is not only a convenience depending on which hand you feel more comfortable using but also they can be zipped together making for more warmth when sleeping together. There are many who believe that quality goose down can’t be beaten for insulation material. However, there are other factors to consider if it’s the best for your purpose. Down is a natural product that comes from geese or ducks. Down are the tiny filament covered feathers close to their bodies underneath their outer plumage that keep them warm when they live outside in freezing temperatures. It is very durable retaining its lofting ability for many years. Ethically, it is best known where any manufacturer sources their down, so ensures that animals are not suffering for your convenience. Some down bags come from a byproduct of meat production, while some are from natural, annual molts. Responsible Down Standard (RDS) is one measure that a manufacturer is following responsible suppliers. Different breeds of birds give different loft measurements; older birds produce fluffier down while younger birds produce less fluffy down bags. This loft power is measured by a CUIN (cubic inch per ounce) which measures how much volume is taken up by an ounce of down. A higher CUIN value Better indicates less weight to warmth insulation. A fill power of 400-450 is average, while up to 750+ is viewed as excellent. A downside of the down (excuse the pun) is that it does not function well if damp. However, new techniques are giving down water repellent properties. Companies are constantly in the process of developing new synthetic fibers that will compete with natural down for warmth, durability, and weight. Most are currently based on polyester for sleeping bag insulation. Those using short fibers attempt to emulate down properties while others use longer staples that form an aerated mat which is easily sewn in place. Synthetic fibers tend to weigh more for comparative warmth and are less compressible. However, synthetic sleeping bags are considerably less expensive and do offer acceptable alternatives to down in many situations. They also function well in damp environments and will keep you warmer if they get wet. Also, they do not have a direct ethical issue concerning animal products, although there is some discussion about how good they are for the natural environment in the long-term. It is impossible to be exact when it comes to accurately predict just how warm any bag will be as there are just too many variables involved. The person sleeping in the bag will have different requirements, sleeping positions, size and even changes of body temperature during the night. Women tend to feel the cold more than men. Then there are the surrounding physical factors like humidity, temperature, wind, ground temperature. 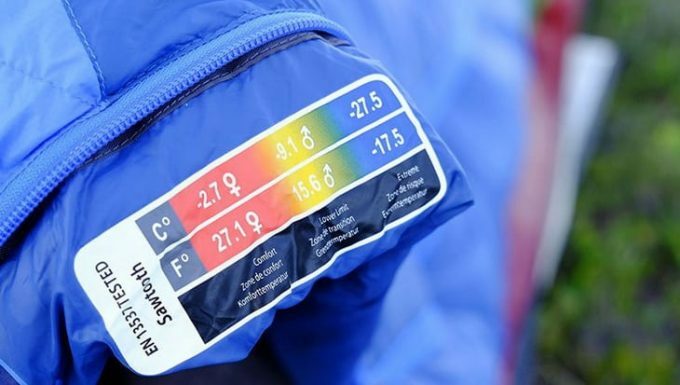 Below are good ways to approach a purchase when you consider which temperature range your bag will be used. If the manufacturer only rates the bag you are considering, it is fine too. However, manufacturers know it is in their best interests to have satisfied customers, so they will try to be as accurate as possible. A reputable manufacturer will be honest with their estimation. They may want to keep costs as low as possible for their consumers, and independent testing will add to the price. 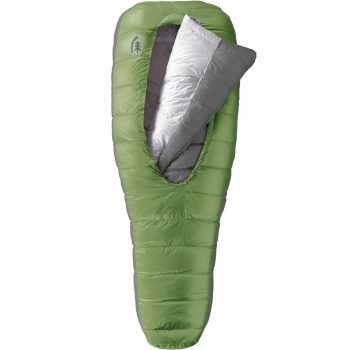 The sleeping bags we are reviewing are mostly for the rating +30°F to +55°F. They are mostly mummy shaped or have some variation of the mummy shape, which makes for some interesting innovations. It is good to see some manufacturers constantly striving to make a better product, although not all features will suit all customers. The fabrics chosen will impact on the durability of your sleeping bag, and most manufacturers use a durable synthetic like nylon. To keep the weight at a minimum they use a Ripstop heavier thread at regular intervals in the weave to reduce the likelihood of long tears and damage, while the majority lighter threads keep weight to a minimum. Down, especially, requires a very tight weave measured in denier to ensure the fine feathers are not lost through the fabric. Zippers can be a weak link, literally as if they are poor quality they may break long before the sleeping bag has shown any signs of wear. In fact, zippers are often a constant source of the issue, so check the quality and size and how well they operate without snagging the fabric. One of the following products does not even have a zipper. Other features may be important to you as well – like inside pockets to store ear plugs, valuables, watch, or phone, insulated neck collars, face drawer strings, compression sacks, and so on. Now that you know all that is needed for finding the perfect sleeping bag for you, we can start with the reviews. 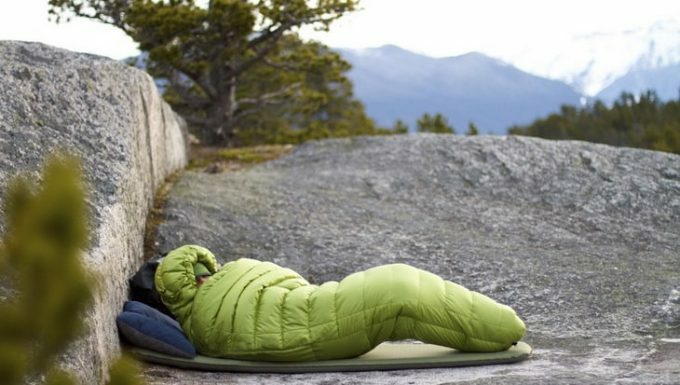 Description: The Outdoor Vitals OV-Light Sleeping Bag is a relatively lightweight mummy shaped sleeping bag that compresses down to a small size, which makes it suitable for backpacking. It is insulated with hollow filament synthetic fill which compresses surprisingly well. The material outer is Ripstop for durability. The manufacturer rates this bag down to 35°F. Each bag is treated with a VitalDry DWR coating to add water repellent qualities which will keep the bag dry and add warmth. 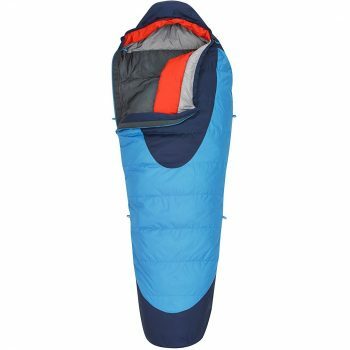 The OV-Light sleeping bag is made with a right zipper, blue colored bag, and a left zipper, orange colored bag so that the bags can be joined. This makes for combined body heat and warmer sleeping in cold conditions. The zips are not completely to the bottom, however, so below the knee, it remains single-use. This bag sells at about $58, which is extremely low cost, but they must be purchased online as there is no brick and mortar retail outlets. Related: You should consider getting a Klymit Static Sleeping Pad to use on your outdoor adventures. The sleeping pad goes well with the sleeping bag and gives you additional comfort on your adventures. 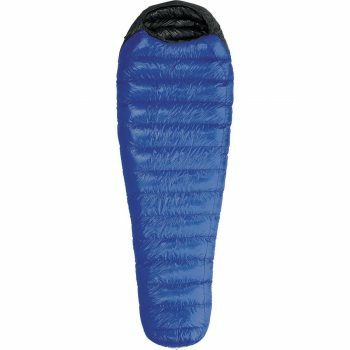 Description: A unique feature of the unusual Nemo Salsa Sleeping Bag, is the “spoon” shape, which resembles a peanut – wider at the shoulders and elbows, narrower at the waist and wider again for the hips and feet. This allows for greater movement than conventional mummy shaped bags. Stretch seams also create the ability for greater freedom of movement. The regular size fits up to 6’0″ with shoulder dimension 64”, hip 60 “and knee 64” while the long size 6’6” height, shoulder 66”, waist 62”, knee 66”. The foot box is about 60” at the knee rounding off below that. The hood keeps warmth around the head area, and there is a pocket to place a pillow or clothing. A zippered watch pocket inside allows for storage of smaller items in the bag. This bag comes with a stuff sac and which is large and suitable for storage. 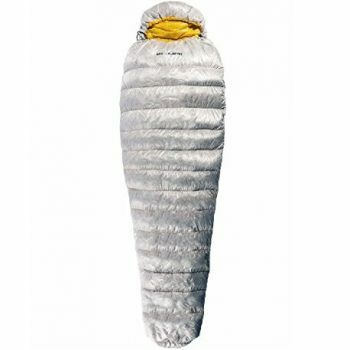 Nemo Salsa Sleeping Bags are rated for 15°F and 30°F respectively as three seasons by the manufacturer, and the Ripstop outer adds to the bag’s durability. Related: After purchasing a sleeping bag, you will need a pillow to go with the bag. The Trekology Ultralight Camping Pillow makes sleeping even more comfortable and makes your outdoor memorable. 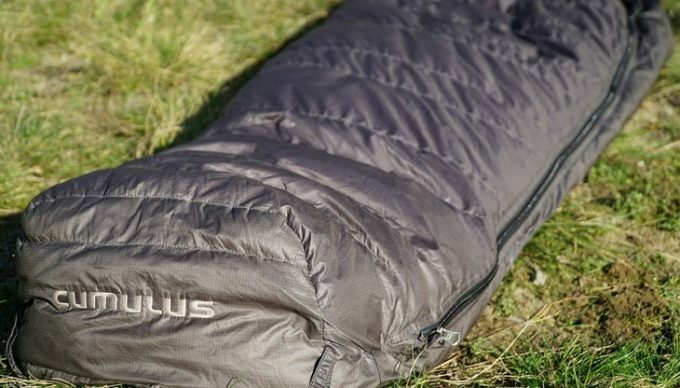 This sleeping bag has several features that keep it lightweight and highly compressible to fit easily into any backpack. The Sea to Summit Spark II has high-quality rated 850+ lofts for extra warmth from Ultra-Dry Down at a composition of 90/10 European goose down. The inner is lighter weight 15Denier nylon soft touch for a high-density weave while the outer is a more durable 10D UL Nylon treated with DWR for water repellent properties. Additionally, the bag comes in a mummy shape, and it is great for camping and backpacking even in the harsh winter weather. It is constructed in a mummy shape with sewn through transverse baffle construction. The shorter 1/3 length side zip reduces the possibility of heat loss, however, does not allow for ventilation in hot weather. The manufacturer rates this bag at 35°F, and it retails at about $370. Related: A tent is essential on your adventures. It does not matter whether your journey is short or long, a sleeping tent is handy when embarking on an adventure. Therefore, we recommend checking out the Alps Mountaineering Lynx 1-Person Tent. The sleeping bag comes in a mummy shape with the left and right zips. There is also a cool feature where you can open the bottom of the bag and hook up the lower part so you can effectively walk around with your upper body in the bag. This little feature makes it great for relaxing around the camp before settling down for the night. With no zip around the foot, there is less possibility of heat loss, but some people like to be able to open the foot area when the temperature is high. With the Vitals OV-Light, you would have to bring your leg out from about the knee. Those who are restless sleepers and turn over while sleeping, will find this bag very roomy and comfortable, and very warm even in below freezing temperatures. Related: Taking a backpack with you on your adventures is a must. The backpack allows you to bring with you the essential things you might need on your outdoor adventures. Therefore, we suggest taking a look at Teton Sports Scout 3400 Internal Frame Backpack as it offers plenty of space, and is highly durable and perfect for outdoor adventures. 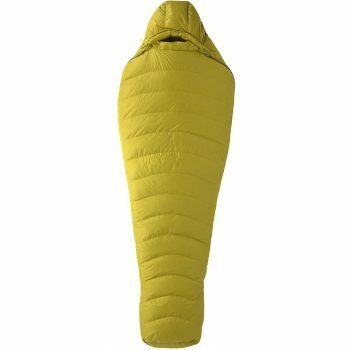 Description: The Marmot Hydrogen Sleeping Bag is mummy shaped, and it has what it takes to keep you warm in cold temperatures. This bag has curved baffles to resist down movement, wrap around baffles so that insulation can be moved from back to front in cold weather and the hood on the is also baffled for extra warmth. The sleeping bag is filled with high loft 800+ goose down in the California, U.S.A. as part of quality control. It is very lightweight at just 1 lb, and compresses relatively small for backpacking. The second fold-down zipper provides the extra possibility for ventilation in warmer weather and easy access to the bag. The zipper has a special anti-snag design which, anybody who has suffered from a stuck zipper will know is a plus. The footbox is designed to reduce the feeling of restriction around your feet but still keep you warm. The Hydrogen retails for about $350, and the manufacturer has a rating of 30°F. Related: If you want to protect your sleeping bag from sharp rocks or branches that might find their way into your tent, or insulate the bag from the damp, if you are using it in the outdoors, we recommend getting a tarp that you can place under your sleeping bag. A good model that you should check it would be the Geertop Waterproof Tarp. 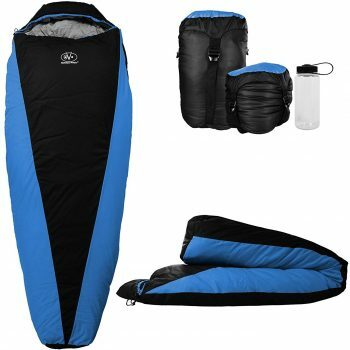 Description: This synthetic fill sleeping bag is slightly heavier than down with less compression, but still offers a lot of backpacking, especially considering the price at about $90. The Kelty Tuck 22 Degree Sleeping Bag is mummy shape for warmth, but has an easy opening for ventilation, and the zipper allows the feet to be easily exposed below the knee. The manufacturer rates this bag in a cool 22°F with its trade mark synthetic ThermaPro™ insulation, which is designed to offer superior heat retaining properties. Actual fill weight is 31 oz and 33 oz depending on size. The Regular size is recommended for people up to 6 feet, the Long for those up to 6 feet 6 inches. We think that this product is great value for money, and that it is quite comfortable and will keep you warm in most camping conditions. Also, a stuff sack is included in the package. Related: If you want added comfort and insulation from the cold ground, you should invest in a quality sleeping mattress. It will also keep your sleeping bag from getting dirty, thus it will need less washing and will last longer. We can recommend the Therm-A-Rest Z Lite Sol Mattress. 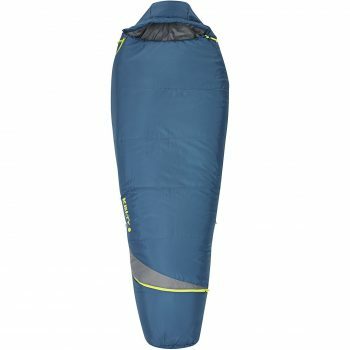 Description: This Kelty Cosmic Sleeping Bag is similar to the previous regarding performance, but is filled with 600 DriDown instead of synthetic insulation. The outer part of the bag is made with a 50 denier down proof polyester. So, no heat escapes out of the bag, and the inner lightweight of the sleeping bag is 50 denier polyester taffeta. This sleeping bag comes with a stuff sack, but will compress further with a suitable size compression sack purchased separately. The standard mummy shape helps heat retention with the “thermal-comfort” hood as well as the shaped foot box. The long 60-inch zipper is fitted with dual runners to open from both ends for ventilation, and the zipper can be locked in place, so it doesn’t slide up as you move around. 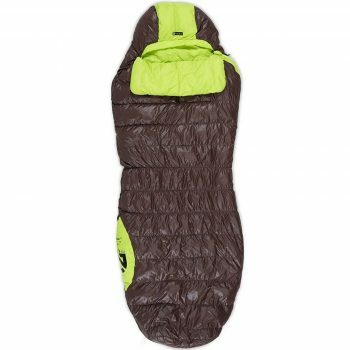 This sleeping bag is imported by Kelty and given a rating of 20°F. Related: For an improved comfort and insulation from the cold ground, an inflatable pillow might be a good choice. We recommend checking out the Marchway Inflatable Ultralight Camping Pillow. Description: This Sierra Designs DriDown Sleeping Bag is full of innovations that may suit some people more than conventionally styled sleeping bags. The main bag is a tapered loose mummy shape with an oval catenary shaped opening center front extending to about half way. Instead of zipping closed, a comforter fits inside this opening to keep the sleeper fully covered. The comforter also has fitted pocket shapes in which to place one’s lower arms and hands for extra warmth. 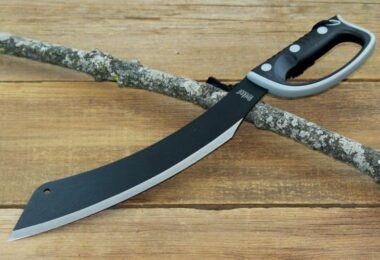 It is also fully removable so you can use it to keep warm while sitting around camp. Or sleep with it folded down the front to expose your upper body, although the bag still wraps around the sides. There is no hood, but the bag is shaped around the head area. The bag also has a slot through which you can ventilate your feet from the knee down. Both bag and comforter are filled with 600 Fill DriDown which helps to keep the weight and size down, although, this bag is not a backpacking lightweight. With no zips or drawstrings to cause problems, this bag does offer an alternative to conventional sleeping bags. There is also an integrated sleeping pad pocket so that you do not slide off your pad in the night. Related: This manufacturer also offers a high-quality camping pillow. The Sierra Designs DriDown Pillow will not only help you rest better, but it will also add a layer of insulation and keep your head warm. As for the best down sleeping bag, it will come down to your personal needs and preferences. There is quite a range of prices between these bags, so if the price point is a deciding factor, you might want to extend the budget a bit. However, Kelty does offer a lower priced down bag that purchasers seem very happy with. If you camp mainly in warmer temperatures, consider those that offer foot ventilation with pockets or zip openings. It’s not a pleasant feeling having to haul yourself up and out of a half zip bag, then an hour later find you are too cold. It is interesting to see manufacturers looking to offer innovative alternatives for people who are looking for comfort and warmth in a sleeping bag. The spoon/peanut shaped sleeping bag from Nemo offers ultimate comfort for people who turn a lot at night and hate that uncomfortable feet feeling. The most innovative in is probably the bag from Sierra, which we suspect people will love or hate, but having not zips to catch will be a plus for many. However, there are still traditional styles for those who prefer “tried and true” like those from Marmot and Western Mountaineering, both established reputable companies. Let us know what you think about your favorite summer camping and backpacking sleeping bags in the comments below.